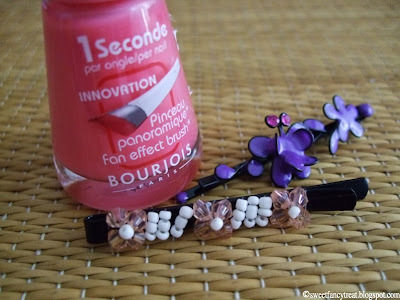 This is the nailpolish I bought last week. My intent was to pick a distastefully shade of pink. It gets like that if you apply two coats. Actually, it's more like a bright shade of baby pink. But in one coat it's almost sheer. Oh, I so love this! I was bored with this cherry colored one and this other one was to bright. Also, I got these flower hair pins. One in purple and a more toned down one in brown. Today I Owned The Sky. Pieces Of The Day.